The scene is set at a gypsy camp in the 1940s, as Zharko Stepanowicz (Sterling Hayden in one of his late-career mandatory beard roles), self-proclaimed King of the Gypsies, demands to be given young Rose (Tiffany Bogart), as he’s already paid $4,000 for her so she can marry his son Groffo (Mark Vahanian). Rose’s parents object and the elder of the clan demands King Zharko leave without either a refund or the girl. But Zharko and his wife Queen Rachel (Shelley Winters) grab the little girl anyway and take off with her. Years pass, and Rose (now Susan Sarandon) and Groffo (Judd Hirsch) are married, with a young son and another baby on the way. Rose is an expert grifter, a fortune teller on the make and a thief, while Groffo is a useless, violent alcoholic. Their son Dave (Eric Roberts) runs off when young, never goes to school, though when older manages to get a job as a singer, as well as a nice girlfriend (Annette O’Toole). Still, he hopes to pursue the proverbial American Dream, and believes that his life as a gypsy has held him back. But after a few years, his grandfather King Zharko tells him that he’s essentially terminal, and he wants to pass on the title of King of the Gypsies to Dave, bypassing Groffo. When Dave inherits the symbolic title, Groffo, his own father, comes after him, as well as his young sister (Brooke Shields) and the rest of the family, and Dave’s hand is forced. Directed by Frank Pierson, King of the Gypsies (1978) feels very much like a late-period John Huston knockoff. Rather, it feels like an attempt to recreate the success of The Godfather, but in the style of John Huston instead of Francis Ford Coppola, complete with the requisite strange characters and pitch-black humor. It’s not really a mix that works; Pierson was just coming off his anti-success with the box office head-scratcher A Star is Born (1976), and though was a fine screenwriter, feature film directing was not his forte. Framing the standard Bildungsroman/generation clash plot within the mostly secret world of the gypsies of the American Northeast, King of the Gypsies has a lot to offer in terms of unique perspective and cultural interest. Unfortunately, it falls into some nasty stereotypes, usually when it’s trying to be funny. Sarandon acts as though she’s in a bad “Saturday Night Live” sketch, while Judd Hirsch overacts to distraction, desperate for people to see him as something other than Sgt. Dominick Delvecchio. 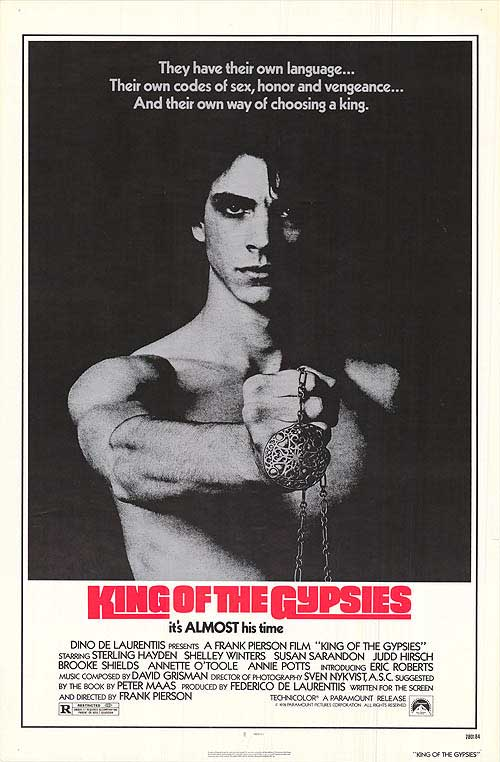 King of the Gypsies is primarily known as Eric Roberts’ feature film debut, and he does indeed give a stunning performance that earned him accolades. This was the beginning of a promising career for Roberts, one that slipped away several years later after too much drugging and partying finally caught up with him. Roberts is almost unrecognizable, though his resemblance to his sister Julia Roberts here is astonishing. Accompanying the star-studded cast are a whole heap of supporting players you will instantly recognize, such as Alice Drummond, Mary Louise Wilson, Matthew Labyorteaux, Michael V. Gazzo, and Danielle Brisebois, who was my favorite actress when I was a little kid, and who I love knowing is now an Academy Award nominee. Stephane Grappelli appears twice as, well, himself, basically, and Patti LuPone can be seen briefly in the background as one of the gypsies. Performances vary wildly in King of the Gypsies. Susan Sarandon and Judd Hirsch clearly think this is a comedy, and maybe it is, but it’s hard to tell because the whole film is pretty confused. It wants to be an American Dream melodrama, but goes too far and ends up as camp, even accidental satire. It tries to be touching but ends up cliched. But thanks to solid performances from much of the cast, it still holds up, even if just barely. Hayden and Roberts are very good, as is O’Toole, though she doesn’t get enough screen time, which is something I say about every Annette O’Toole movie, and I stand by it. There are more than enough worthwhile moments to make the misfires worth sitting through. Plus, it’s beautiful to look at, thanks to Sven Nykvist as D.P. on the film. Nykvist does seem to fall into default mode a little too often, however; let’s just say that King of the Gypsies looks far more like Pretty Baby than Autumn Sonata. But seeing the Z-grade revenge flick finale of this movie framed by a master cinematographer like Nykvist is just beyond entertaining, and that alone makes King of the Gypsies well worth the watch.